I have real pleasure attending this 10th "Chinese Bridge" Competition. I enjoyed it so much last year – so it's very good to be back! We Chinese people love poetry and are always looking for amusing word links. So I cannot resist giving you a link about 'coming back' - and it's from a poem written over a thousand years ago. The poem was written in the Tang Dynasty – a period which we think produced many great poets. This literally means "Here comes Mr Liu again". Now that's rather apposite tonight - as I am indeed a Mr Liu come back again! This 10th anniversary must be a celebration – as the competition is now a huge success. The aim of the competition – to use an English pun – is to to create a deeper 'bridge of understanding'. It has united college students worldwide. Since it started in China in 2002 a hundred thousand students from more than seventy countries have competed. Now that's something well worth celebrating! 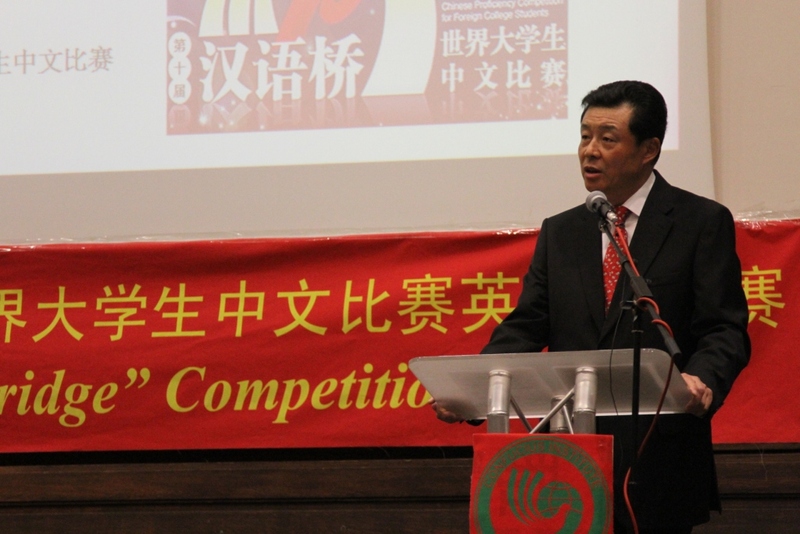 Also we should give a big cheer for how the competition is boosting the learning of the Chinese language worldwide. Making learning fun is a sure recipe for success. I am certain that formula is the why the competition is a winner. I come back to bring you good luck again. The same event last year produced three finalists. One of them, Mr Stewart Johnson, went on to win the very top prize in China. The other two won third prizes in the finals. That was Britain's best ever performance. I wish you the very best of luck to achieve the success of the UK contestants last year – and they set you a rather high standard! So there's the challenge! I wish you more world-beating success from you British contestants this year! I come back to heat up the Mandarin fever. The contest is motivating the learning of Mandarin. I cannot tell you just how thrilled I am by that. 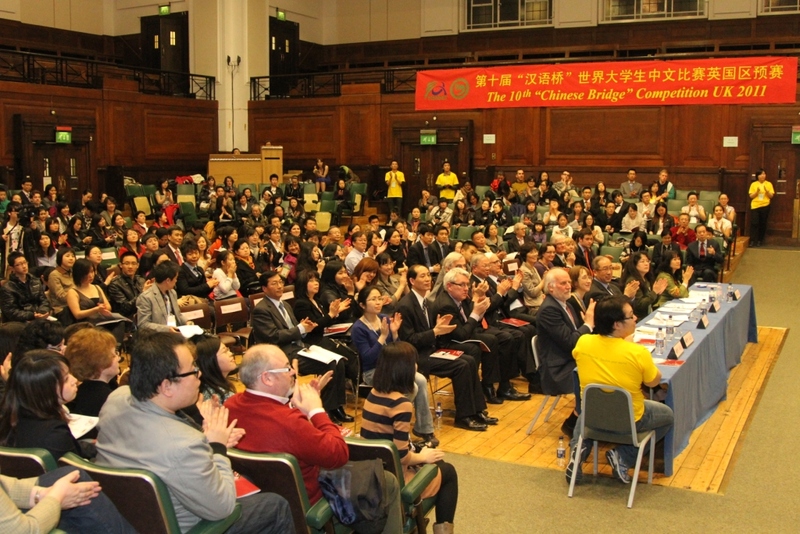 Nearly one hundred thousand people are learning Mandarin in Britain. In your secondary and primary schools - one out of six schools is teaching Mandarin. 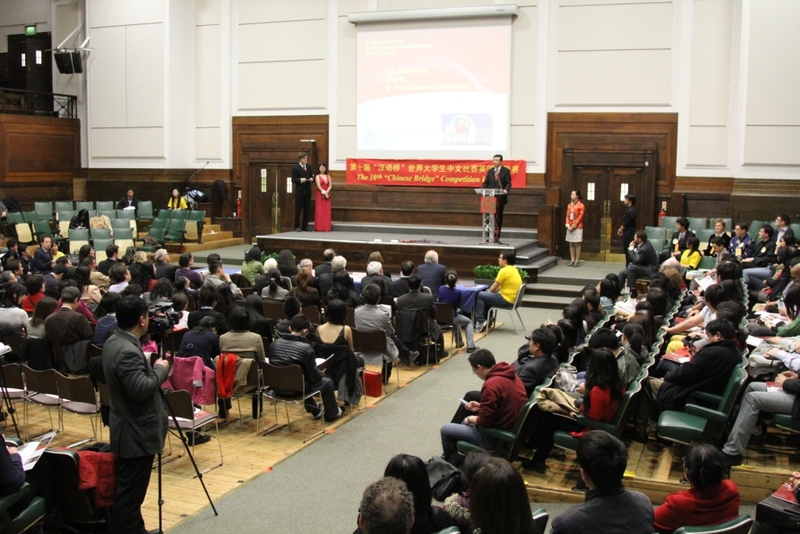 In your higher education - 54 British universities teach Mandarin. 7 of those universities offer Mandarin as a major subject. Then there are 13 Confucius Institutes and 54 Confucius Classrooms that have been opened. On a personal note, not long ago, I had the honour of joining His Royal Highness the Prince of Wales in the opening ceremony of a Confucius Classroom at Llandovery College in Wales. His Royal Highness said to me - in surprisingly pure Mandarin - "Wei Er Shi Huan Ying Ni!" (威尔士欢迎你, Wales Welcomes You). What a wonderful example of leadership by the Prince to encourage young people to learn Mandarin! His example is very valuable. I come back to cheer on the young Britons who started learning Mandarin. Languages are the most important carriers of cultural messages - and the key to effective communication. The structure of written Chinese language means it is a vital key to the history and culture of China. Mandarin is the path to explore and enjoy the 5,000-year-old history of China. Over time, as you study, I know you will be inspired and influenced by the immensity of China's cultural heritage. In turn a grasp of China's heritage is essential to really understand modern China. As China has risen – in just over 30 years – my country now ranks as the world's biggest exporter and second global economy, as measured by GDP. Given this rise it is surely a "no brainer" for any young person to understand China. China's 'blueprint' for the next five years was published last week by our Parliament - The National People's Congress. This 'blueprint' stresses the importance of adjusting China's growth model. This means changing the economy from dependency on exports to encouraging consumption inside China. The plan will strengthen social programmes - such as education and medical care - and so improve the quality of people's lives. But, growing in size and quantity is by no means China's goal. What China is after is high quality growth and a happy life for its people. The aim is for every Chinese to share in the success of development. The 'blueprint' wants China and its people to more and more "go out" into the world. All this points to very great advantages for young Britons to start learning Mandarin and begin to really understand China. I come back to cheer for China-Uk friendship. China and the UK share much a great deal. We are both great nations who have made tremendous contributions to human civilisation. A key shared attribute is our inventiveness. A simple example is in creating revolutions in communications. China gave the world paper and printing. In turn UK used paper and printing to create another communications revolution. This was the invention of the postage stamps and low cost mail delivery. Both our countries play a major role in global affairs. Both are increasingly drawn together to promote economic development. Often our exchanges stress economics and trade. But I believe the optimal way to accelerate trade and economics is with much deeper cultural understanding. That is why this competition has such huge significance. Through building the bridge we link the young people of the world. Young people are the future and so the future of our friendship. I cannot grant magic wishes to make you all champions – but let me wish all the contestants best of luck. Now please allow me to officially announce the opening of the 10th "Chinese Bridge" Competition!